It is getting to be that time of year when we think of fall colors and black cats. I am getting into the "spirit" of Halloween and making a kinds of mischief in my art room. 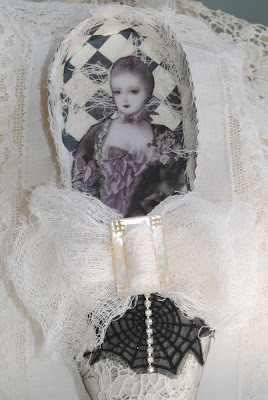 I belong to a really fun group of creative people called Marie Antoinette Mail Art Group. We make art and participate in swaps that center around Marie. Swaps are so much fun because they make me try new things. Today I am showing you a few of the swap items I have been making. The first photos are of shoes that I have made. I have a free video tutorial on the side bar to make shoes. I made this tut earlier in the year, it is the same template but a spring version of the shoe. This is my Halloween version. I used all vintage materials, except for the papers. 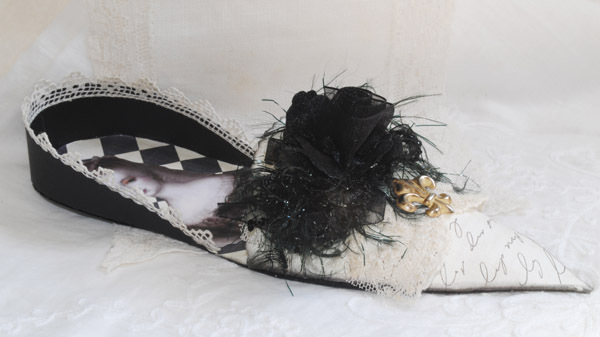 It is hard to see, but there is a gorgeous black rose on the front of the shoe below. 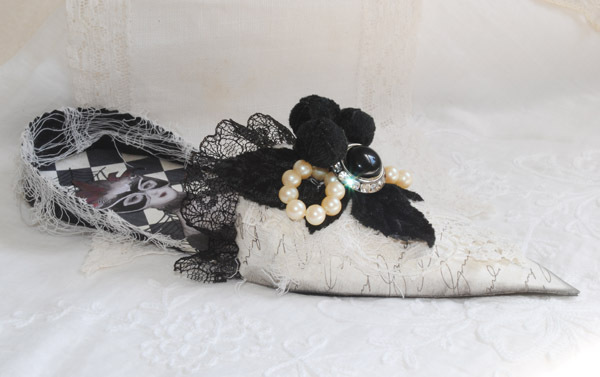 I received some of these roses from a Halloween swap last year and they were perfect for the front of this shoe. Can any one tell me how to get good clarity in a photo with dark items? I loved making the bow out of cheese cloth. I love cheese cloth! These are little doily bundles that I tucked into each shoe. 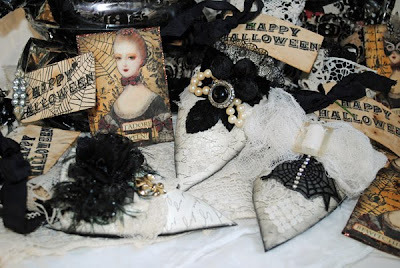 They are filled with Halloween textile treats like fabric, vintage lace and ribbon. These triangles are for a banner swap. I have never made a banner before, so I was excited to give it a go. I will send these off and receive back triangles from other swappers to make my banner from. I can't wait to see all the different creations. These are some Marie Halloween ATCs I have been playing with . I coffee dyed the cards first and then stamped and added to them. I hope that your week is full of creative opportunities. Marvelous Terri, oh my gosh what can I say !!! 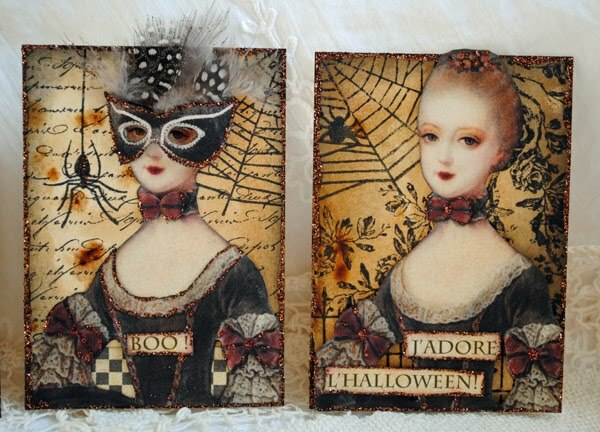 These Halloween Crafts are amazing, I just love them. My gosh Terri you are so incredibly talented and imaginative and you have a wonderful heart as well to post a free tutorial. I will check it out later, thanks a bunch! You are DEFINATELY in the spirit of the Halloween season. 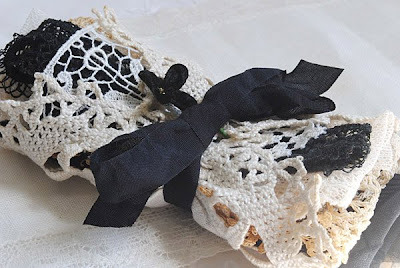 LOVE those slippers with cheesecloth & black and white. Outstanding! And the banner challenge is so cute...love the rick rack around the edges. Marie is looking mightly regal, too! Thanks for sharing and now I think I need to find some paper and get to cutting out something for the season, too! Terri I LOVE your shoes. The cheesecloth as a bow it great! SQUEELING, I love this!!! I may have to give that shoe a try!!! Fabulous creations. Those shoes, they are just amazing. Love those banner triangles as well. I love your crafting style - very antique and feminine looking. The shoes and ATCs are great. Terri I love how you showcase all of your Marie Halloween stuff in this post. :) That cheesecloth bow is amazing! I noticed it right away. Look at all that Halloween fun!! Love your color palette! Everything is just beautiful!!!! This is great!! So funny Marie Antoinette in Halloween style! Fantastic!! I just love it! omg, your projects are just gorgeous, the shoes are amazing ... i'm a big fan of your work! thanks for the inspiration! Love your latest shoes too and I can see the black rose, but I know what you mean. I have a black dog and he is sooooo hard to get a good photo of, I have to take his photo outside mostly. Wow Terri...these are all super amzing..totally my vibe..i love all this gorgoues enchanting energy..such festive beautiful pieces...wonderful post!!! Terri these are AMAZING!!! Thank you for sharing them!! You are incredibly gifted! Sooo boo-ti-ful! I love all your details. amazing! Terri these are all fabulous! Everything you make is so beautifully crafted. I'm not a fan of halloween but you have inspired me with these special pieces. Eeek! Aren't you just too clever for words?! You just singlehandedly put me in the mood for Halloween! Love them all! I have had such fun poking around your blog! 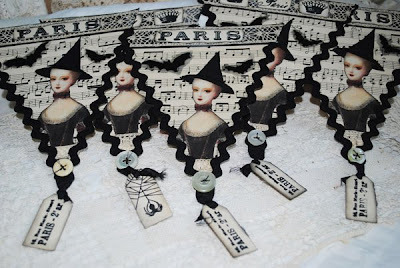 Love your halloween post, your tutorials and French Fridays! Will pop in on a Tuesday soon! Wow, these are absolutely stunning! Love all your Halloween inspired creations, but especially your ATCs and those shoes! these are fabulous! I love each one - awesome designs and oh so clever! I have never seen "Marie" in this light - but you do it with perfection! Have a wonderful weekend! I don`t like hallowen holiday but I Love your Halloween creations, and I love your shoes. Hi again Terri..oh my..it sure is fun revisiting this dazzling and gorgeous post of creativity! beautiful work! PS: thanks for popping by both my blogs and your lovely comments!Yay..so appreciated! Your spell was perfect and freed my from the mirror of mazes..thankyou! and so happy you liked my vampire painting..would love to know the name you "hear"... and to answer your question..I have felt the names of some of her lives to be..Isabel, Sara/Serafina, Josephine..and Tatiana to name a few! thanks for always adding your sparkle to my day! 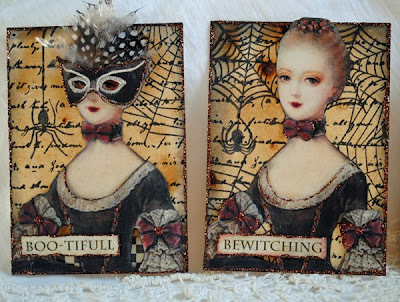 Gorgeous Halloween crafts. Halloween is starting to get popular here, but I really don't like all the ugly, scary stuff that forms most of the decoration. This is much more down my alley! I don't know what type of camera you have, but to photograph black, you have to try to get a meter reading off the darkest part. Try for a spot reading rather than matrix metering if you can change the setting. A camera tries to average the entire image to 50% grey, so both a lot of white or black can cause problems. If you can expose correctly for the black, you will see a lot more of the detail. Try filtered, not direct light and don't use a flash. I hope this helps. Hi Terri! Thank you for your warm welcome back to blogland. I just was blown away by your latest creations. The show is tres chic, my friend, and oh so creative. There is just something about Fall and Hallowe'en that gets those artist juices flowing, isn't there? Oh hi Terri, Love these thanks for sharing. Please feel free to link up this post to either site of mine for our Autumn / Halloween Link Up! Would love to see you their~ and any other season related posts! Have a wonderful day and thanks for the pretty inspiration!! I can imagine the fun you have making these! Your post is wonderful and it made me think about the amazing bag you made for me last year. I loved all the creative treasures you made for me. You are one very talented lady. Terri what gorgeous things you have made....you have such a great style. What a wonderful collection of Halloween treats! Love those Halloween shoes! These ATC's are terrific, Terri. I think you are so talented, and I enjoy seeing your work, very much, and reading about your teacups. I especially like the Queen's anniversary cup.